Caramelized Onion Feta Pastry Bites from Trader Joe’s are one of their most popular frozen appetizers (and most expensive) and they’re easy to make at home! 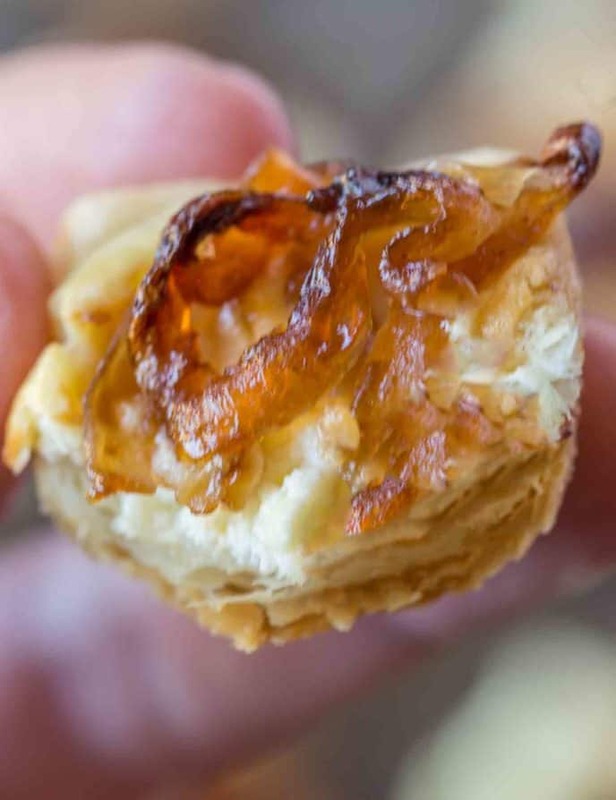 Trader Joe’s Pastry Bites with Feta and Caramelized Onion are an addiction that is pretty darn hard to stop once you’ve tried them. Plus, they’re expensive which isn’t awesome when you need multiple boxes for a craving. 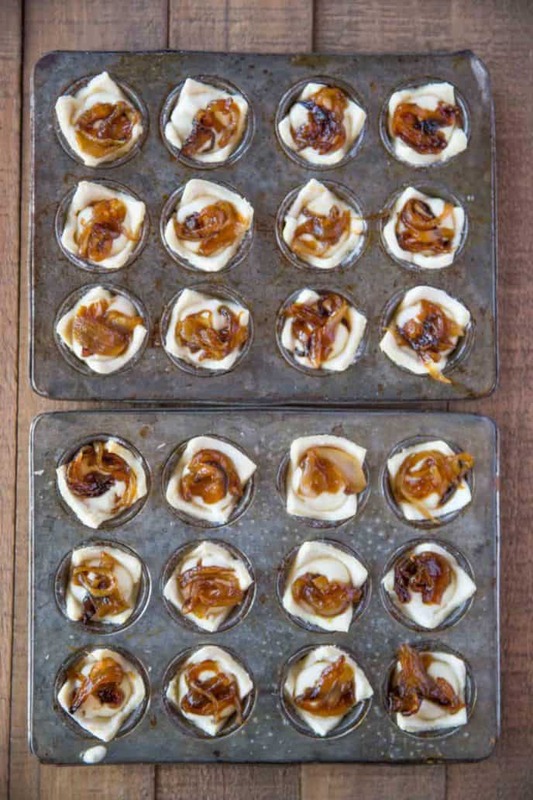 These Caramelized Onion Feta Pastry Bites are so inexpensive and easy to make that you’ll find yourself making them for all your dinner parties. Best part ever? You can prep these ahead of time and freeze them. When you’re ready to serve them you just pop them into the mini muffin tins and bake. chopped ham and Swiss cheese instead of feta and onions. 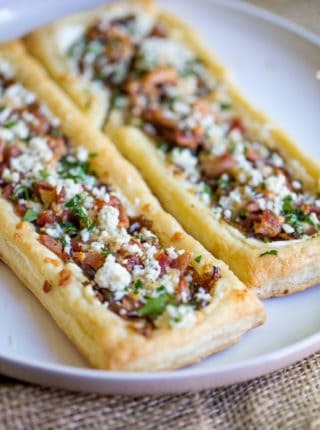 Want to freeze these Pastry Bites with Feta and Caramelized Onion? Follow the directions up to right before you would put it into the oven. Freeze the bites for 2-3 hours then store in a ziploc bag. When ready to cook, put them into the muffin tins and bake for 20-22 minutes. 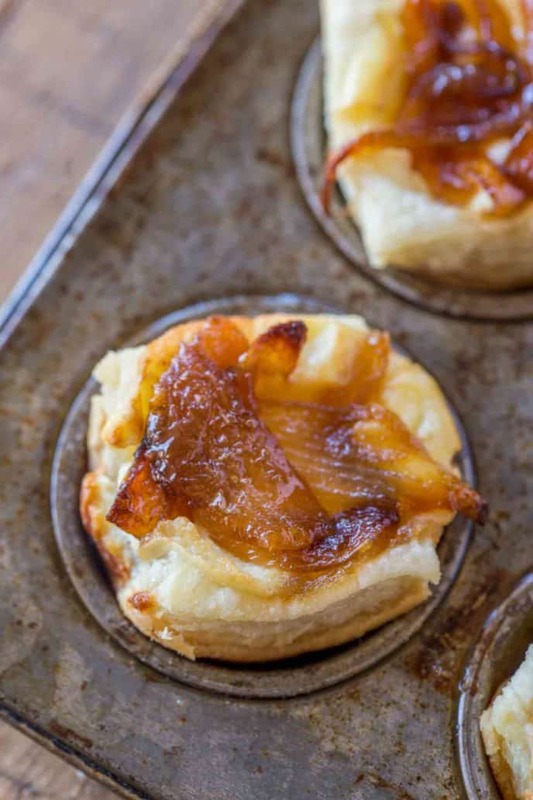 Do not bake them without the mini muffin tins, the puff pastry will flatten into pancakes making a mess. Want to make this into a slab? Add half the sour cream and keep the puff pastry in three large triangles. Score a rectangle shape a half inch from the border and fill with the feta mixture and top with onions. Bake for 20-22 minutes. Directions can be found here. Mini Muffin Tin: Make sure you’re using the right size, these are perfect for a one bite appetizer. Cast Iron Skillet: The perfect pan for caramelizing onions, a nice heavy bottomed even cooking pan. 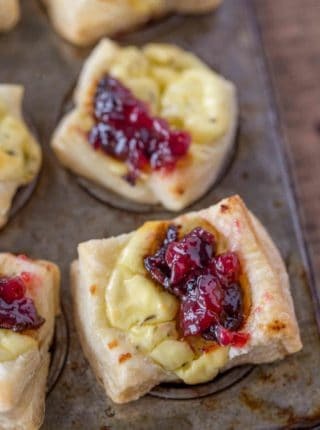 Caramelized Onion Feta Pastry Bites from Trader Joe's are one of their most popular frozen appetizers (and most expensive) and they're easy to make at home! Slice the yellow onions thinly and put them in a cast iron skillet with the butter on medium-low heat. Add salt and brown sugar and cook on low for 15-20 minutes until browned, stirring every few minutes. In a bowl whisk together the feta, butter, sour cream and eggs. Unfold the puff pastry rectangles and cut each three piece sheet into 30 squares. 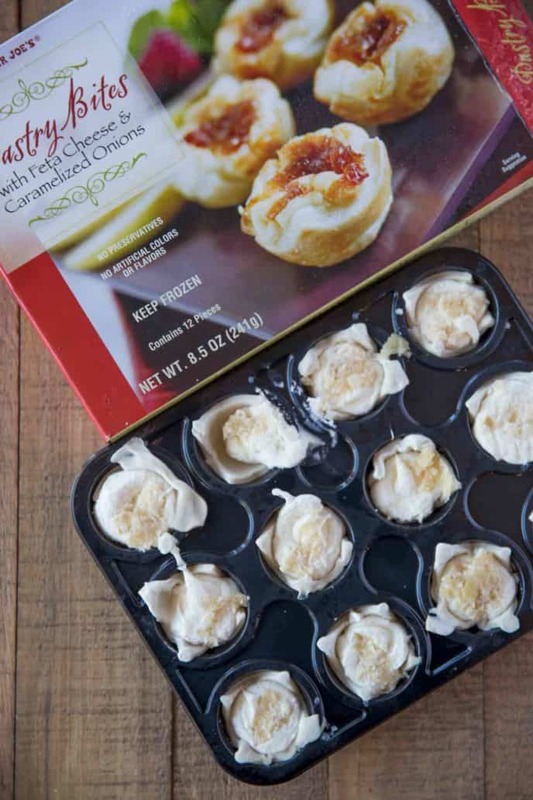 Spray the mini muffin tin with cooking spray and put the puff pastry squares into each well. Spoon in a scant tablespoon of cheese mixture into each well, then cover with a few pieces of onion. If freezing: Add the ingredients to the muffin tins and before baking put the trays into the freezer. From frozen bake 20-22 minutes. 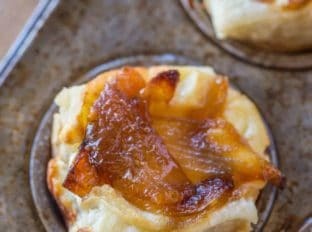 If I already have caramelized onions on hand, how much would I use for this recipe? About a 1/2 cup would be plenty! I followed the recipe exactly as written except my mini muffin tins only made 24 instead of 30 tartlets. I froze them unbaked in the tins. I baked them right before I took them to a party and this worked out perfectly. They were a huge hit and were gobbled down within minutes! So glad everyone loved them! I really appreciate the 5 star rating! What does 3 ounces of feta look like? Is there another measure you can clarify? Maybe tablespoons? Just made the blueberry goat cheese ones. 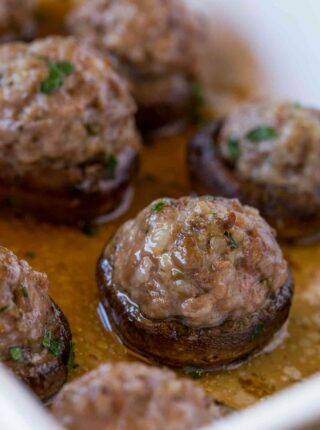 Have made several of your other recipes and always turn out great! Thanks! I’m so glad you’re enjoying the recipes. 3 ounces of feta would approximately be 3/4 cup worth. These are wonderful!!! They are perfect even the frozen left overs are great. So glad you enjoyed them, Lynn! 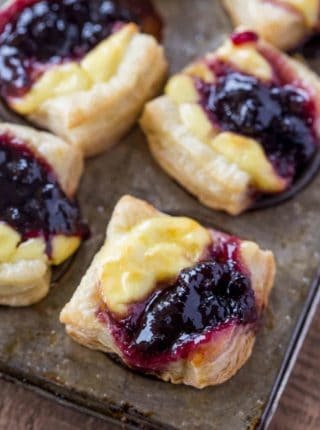 Puff pastry (enriched wheat flour (Wheat Flour, malted barley flour, ascorbic acid [vitamin c as dough conditioner], Niacin, Folic Acid, reduced Iron, Thiamin Mononitrate, Riboflavin), water, butter, salt), cream cheese (pasteurized cultured cream, milk, natural acids, salt, xanthan gum, carob bean gum, guar gum), onion, feta cheese (pasteurized milk, salt, cheese culture, enzymes), egg, sugar, unsalted butter [milk]. The reason I use sour cream instead is because cream cheese has very pronounced flavor and your bites will taste more like cream cheese than feta. Feta is so mild it can easily get lost and overpowered. You never know what type of cream cheese TJs is using (not like our store bought kind) and it’s not affecting the flavor profile as it would if we used it. Feel free to test it using cream cheese but don’t be surprised if it doesn’t taste like feta anymore. I stand by using sour cream for this recipe. I hope you enjoy them either way. Just to clarify, do I use 3 sheets of puff pastry total (1 on top of the other), then cut the block of puff pastry sheets into 30 squares? Sorry for the confusion. 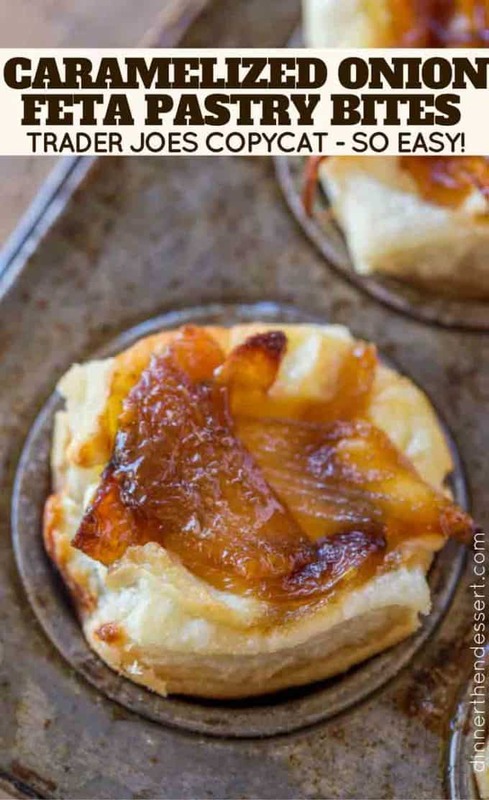 The puff pastry sheet is originally folded into thirds. You’ll want to completely unfold it and cut it into 30 squares (total). I hope this clears it up for you. These are my favorites at Trader Joe’s! Happy to have a homemade hack. I subbed 3% fat plain yogurt for the sour cream, and subbed sharp cheeses I had on hand instead of the feta. Tasted delicious! Only next time I will halve the butter, as the dough was soaked even after doubling the baking time. Regardless, super excited to make these again with this tweak.